The cello part for Rimsky-Korsakov's Scheherazade, Op. 35 has been edited by Stephen Geber, who served as the principal cellist of the Cleveland Orchestra for 30 years, from 1973 until 2003. Geber's bowings, fingerings and other editorial markings have been added throughout the score. Rimsky-Korsakov's Scheherazade is a symphonic suite based on stories from the collection One Thousand and One Nights (also known as The Arabian Nights). It combines two features typical of Russian music, and of Rimsky-Korsakov in particular: dazzling, colorful orchestration and an interest in the East. The score was completed in 1888. Scheherazade consists of four related movements that form a unified theme, producing a sensation of fantasy narratives. Each movement is titled with thematic headings based upon stories from One Thousand and One Nights, though the headings themselves are somewhat vague so that they are not directly associated with specific tales. Elements of various stories are represented musically throughout the work. For example, the grim bass motif that opens the first movement is supposed to represent the Sultan, Shahriyar, to whom the title character Scheherazade narrates her tales to in order to prevent him from executing her. 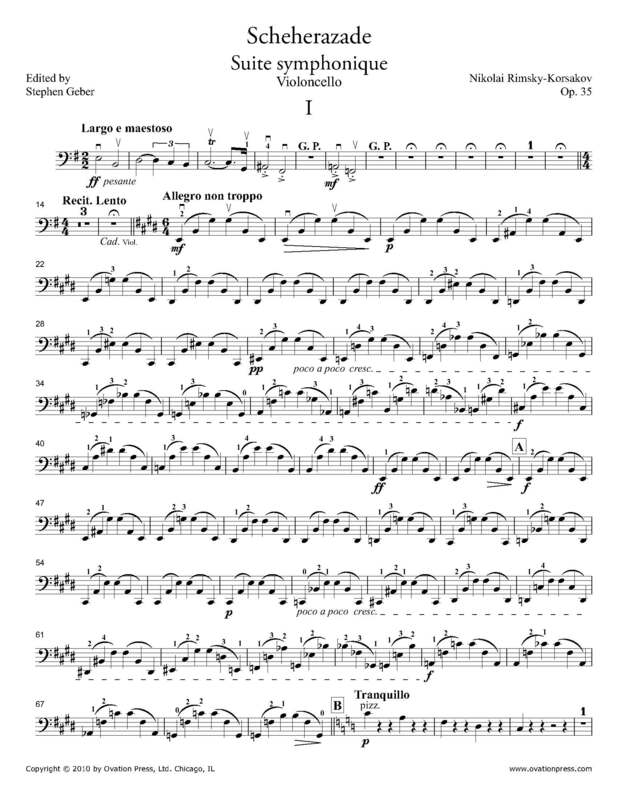 Download and print the score today to gain access to expertly edited Rimsky-Korsakov Scheherazade cello fingerings and bowings from Stephen Geber!